Rooms from $143.65 per night. 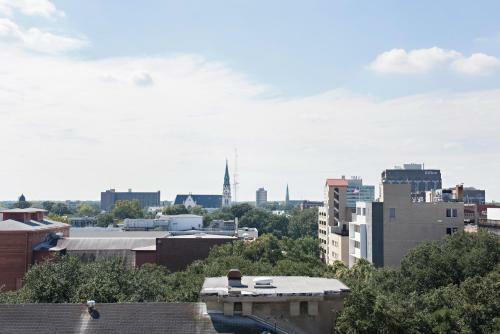 A walk-to-everything location in the historic center of this gracious Southern city as well as modern conveniences and amenities like a rooftop pool put Hampton Inn Savannah Historic District on the map for our guests. 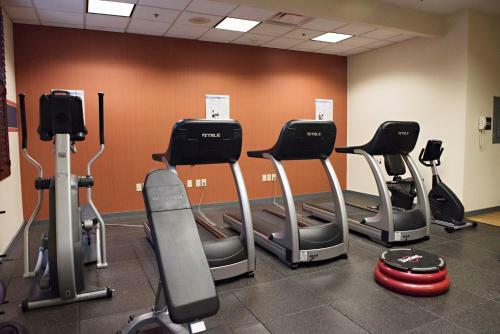 This seven-floor 144-room all non-smoking hotel is located in the heart of Savannah's Historic District. It uses traditional Southern-style gray brick inside and out. The lobby has antique touches and art pieces as well as a fireplace polished pine floors and cushy leather sofas and chairs perfect for people watching or sinking into a book by a Southern author. 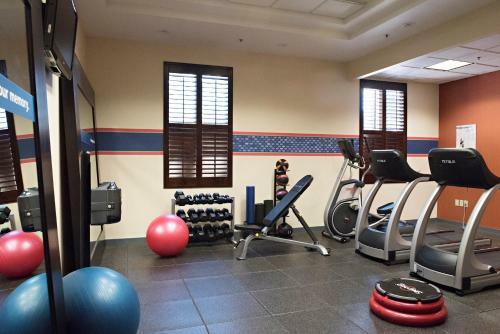 Rooms have 27-inch TVs with premium cable and in-room movie channels free high-speed internet access microwaves and mini-fridges. A hot breakfast buffet awaits you each morning featuring eggs breakfast sausages French toast sticks juices and pastries and plenty of coffee and tea. 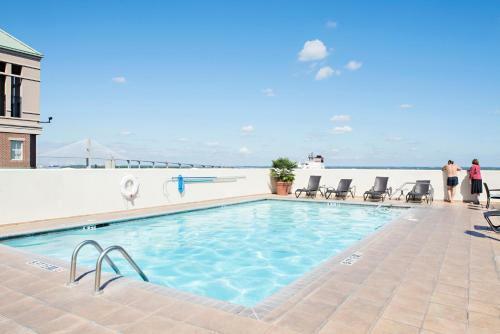 The outdoor heated pool and sun deck are rooftop offering lovely views down on the city. The hotel also provides guests with a free newspaper each day. 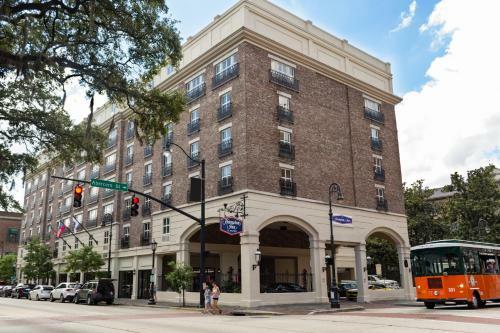 This Hampton Inn couldn't be any closer to Savannah's Historic District. It's smack dab in the middle of it with historic sites antique shops and galleries and beautiful flower-filled squares in all directions. 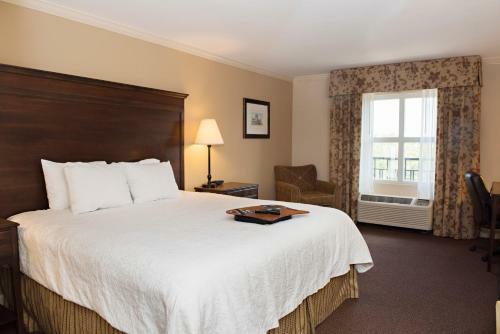 Hampton Inn Savannah Historic District is eight miles from Savannah/Hilton Head International Airport and 25 minutes' drive to the beautiful beaches of Tybee Island just off the coast. 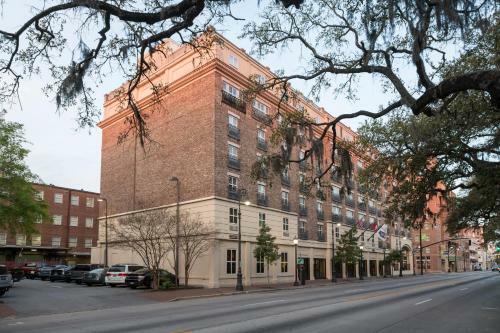 Add Hampton Inn Savannah Historic District to your free online travel itinerary.